I really dread writing what I have to write here, because I'm about to discuss a film that I not only helped fund, but which is produced by a lot of people whose work I have enjoyed and respected over the years. I want to see this crew succeed. Let's drop some names: Nichelle Nichols. Walter Koenig. Terry Farrell. Robert Beltran. Gary Graham. Tim Russ. Bruce Young. Cirroc Lofton. Aron Eisenberg. There are a lot more. And the name of the film is Renegades: The Requiem. 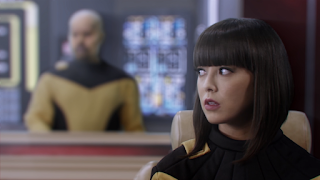 It is the sequel to Star Trek: Renegades. Originally, this started out as a Star Trek fan production, but in the wake of the CBS/Paramount crackdown on fan films, they dropped the Star Trek connection and decided to re-frame it as its own thing. So far it's been released to donors. I don't know when the full release will be accessible to the public, but when it is, I expect it to be pay-per-view or on-demand at Atomic Network. Part 1 is there now. I really, really, really want to like this film. The fact that it started as a fan production makes me want to give it a good bit of leeway. The fact that it is not only staffed and acted by professionals, but that it aspires to anchor a new on-demand streaming service forces me to judge it by a somewhat higher standard. Sadly, whether it be because the budget was stretched too far, or for some other reason, the costumes suffered. That's understandable. Unfortunately, I can find no excuses for the acting or the script. I think you may already see where this review is going to go. Let's start with the cheap shot. First impressions. It's not possible to adequately convey how vitally important the costuming is in a show like this. Get it right, and you can put the characters anywhere. Get it wrong, and no amount of CGI or chroma-key is going to make it look right. Your costume is your most intimate practical connection to your fictional world. And these are execrable. I really don't have another way to say this. Refer to the screenshot. Poor Tim Russ is wearing a tunic that looks for all the world as if it had simply been put on backwards. Puckered seams, bad gathers, foam padding... it's like bad cosplay. Koenig's is no better. And lest you wonder, it's the same for just about anyone wearing a Confederation uniform. Corin Nemec's leaves him looking like Dana Carvey as the turtle guy. The civilian costumes fare better simply because they don't have to follow a standard, and many of them could be assembled from actual carefully-chosen street togs, or simply weren't recognizably Star Trek enough to be replaced on short notice. Again, this is probably a time and budget thing, but it is unfortunate. It's made all the more puzzling because the Renegades-style Star Fleet uniforms were already significantly different enough from existing designs that they could have simply removed the comm-badge insignia. A good bit of the time and budget had to have gone into the re-design and re-rendering of all of the external space shots. 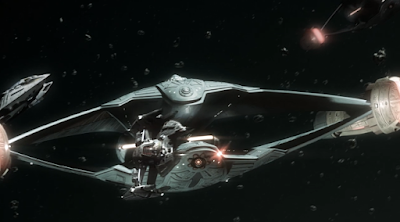 Every ship had to be replaced with a new non-Trek Confederation design. I have no complaints about any of that. I think they did a fine job of it. Then again, I'm probably in a minority when I say that I don't care much about the ships and the FX. I know a lot of people go bonkers over the details of ship classes and designations, but it's the story and the people that hold a show together for me. Still, this is extremely well done. The space scenes are as spacey as they need to be. I also really don't care to go too deeply into the script in this review. If you've ever played any sort of tabletop RPG, you're familiar with the plot summary: baddies are wearing badges, so nobody official can be trusted. A team of ne'er-do-wells has been recruited to work under the table to do what has to be done and save the Confederation. Sacrifices will be made. It's a pretty familiar formula, so I really can't geek out over it for its cleverness or originality. Since they're telling a standard quest in space, success of the production depends on the execution more than the plot. I will say, though, that there's a lot of just standing around and talking in some scenes. See the screen capture, above. It's every bit as exciting as you might imagine standing around talking with your hands at your sides would be. A bit more attention to detail... not in the scripting, but in the filming... could have fixed that. Real people do things while they talk. Sharing some tea would be more natural and visually stimulating. I know there's this great background shot, but it only takes a few seconds to establish the location and walk off the green screen and into a park. The same thing applies to a conversation aboard a space station. Having some age on me myself, I know there is nothing old people like better than standing around shouting at each other from across a large room with no furniture. The production team had a few hard decisions to make, and I don't think they were aggressive enough in their choices. Once you decide that you're not going to be Star Trek, it's time to get rid of the baggage. You know that the character names have got to be changed, so change them. The Treknobabble has to go, so replace it. Trek references need to be excised. Cut them out. Given that the original script was a bit of a darker departure from usual Trek fare should have made the transition not too difficult, story-wise. They didn't go that far. 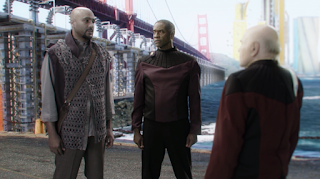 In that same scene I've illustrated above, "The Admiral" is meeting with "Jacob Sisko" (Cirroc Lofton) and "Commander Kovok" (Tim Russ) (of course, these are totally not "Jake Sisko" and "Tuvok" - wink, wink). Andorians become whatever-they-are-now through the simple expedient of removing their antennae. And some other characters have behavior that's only explicable through a connection to their Star Trek counterparts. Again, this is a difficult call, because they're continuing a story that they started as Trek. In script-writing, details are important. Dialogue is important. It really shouldn't sound stilted or forced; and for all that is holy, it can't sound like it is "dialogue". Bad dialogue results in deterioration of the fourth wall, taking you out of the story. It reveals an actor on camera acting. Now you're no longer watching the action; you're watching the screen. 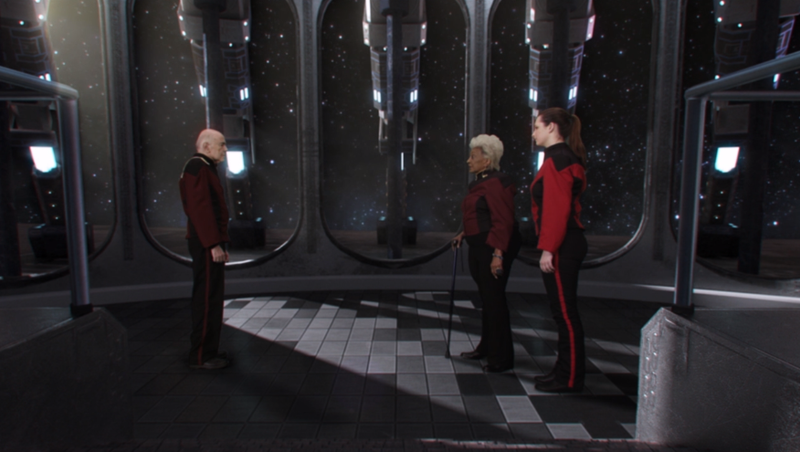 You're not seeing the Admiral talking to a renegade captain; you're seeing Walter Koenig deliver his scripted lines. The last thing you want to do is catch an actor acting. If you're still not clear on what this means in practice, you have only to watch this film. You will catch everyone acting. Even the seasoned professionals. Often, the acting that you catch them at is just plain weird. And it reminds me of something. As a kid, I caught more than a few hognose snakes. These little critters, when captured, decide to play dead. And for a hognose snake, that means turning onto its back, opening its mouth, and sticking its tongue out. If you then flip it back onto its belly, it refuses to act like an actual dead snake would. Instead, it will flip itself back onto its back. It has a certain conception of what "dead snake" looks like, and will act that way every single time, even when it makes absolutely no sense. Something similar is going on in this movie. Let's all watch the captain pant. For instance, it seems as though someone decided that in a moment of tension it's dramatic for a captain to be out of breath. 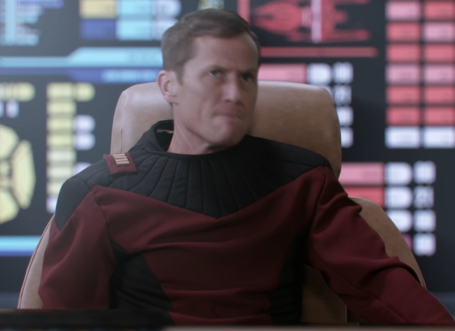 So Captain Singh (Adrienne Wilkinson) is out of breath during a tense moment. She's sitting in a chair. She has been the whole time, moving nary a muscle but her neck and mouth. But she acts like she just lifted a refrigerator. The same is true of Captain Alvarez (Corin Nemec). Sitting in a chair, as captains do; but panting like a marathon runner. Meanwhile, the bridge crew are sitting and standing at their stations, cool and professional. Sure, their ships have been hit, but it doesn't explain the level of exertion exhibited by these two characters, especially when the other actors are more reasonably controlled. There are other 'pre-programmed actions' that occur multiple times, as if there were only one conceivable way of conveying resolution, for example. When that happens with so many experienced actors, you pretty much have to toss it at the director's feet. Sorry, Tim Russ. I don't know what happened between Star Trek: Renegades and The Requiem, but the acting and direction in the first episode was superior. Wilkinson in particular is suffering from an egregious case of trying-too-hard-to-be-a-badass. Every motion is overtly controlled, as if she were constantly engaged in isometric exercises. This is the telltale sign of planned actions. When we see this in CGI characters, we label it "the uncanny valley". We know it's not real. Wilkinson would be so much better if she just loosened it up and let her movements and facial expressions come naturally. And as for Admiral Armstrong, I have no idea why actor Bruce Young decided to use a stilted, snobbish British accent that's a century out of fashion even in our own time. Maybe that's just how they speak in his corner of Illinois and he's been putting us on for all these years. Frankly I wish someone had talked him out of it, just as I wish someone had dubbed over Tom Hardy in The Dark Knight Rises. 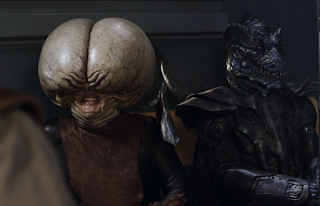 And there's a cantina scene that's just painful to watch although the alien design and makeup are admirably done. There are a few jokes, and every one of them falls flat. The dude on the left is Bevus. He's a butthead. Get it? Anyway, as I said, I spent money on this. I truly wanted it to be successful, so all this beating up on it is intended as purely constructive criticism. And God help me, I'll probably spend money on the next one, too; hoping that they bring the writing, acting, and costuming up to the standards of the set design, SFX, and make-up. But I can be hopeful for the future and disappointed in the present at the same time. And I am.